It is suggested that the gasket manufacturer’s instructions are followed. 1. Should Anti-Seize be applied on gaskets? In some cases, it is not recommended that anti-seize compounds are applied to gaskets because it may cause slippage of the gasket under load or distortion of the gasket, both of which may cause leakage. However, in some systems, the use of anti-seize on gasketed joints is highly recommended because it can significantly ease disassembly in corrosive or extreme environments. 2. What is the Torsion-Tension Relationship? Bolts, studs and fasteners are used to produce a clamping force that given stability to a jointed interface. This clamping force is produced by tensioning the fastener. In most threaded fasteners, tension is applied by applying torque to the nut or bolt head. Therefore, it is necessary to know the relationship between the input torque and the resulting tension in the bolt. Some larger bolts are directly tensioned. For many systems, bolt tightening charts report the input torque required to produce the correct bolt tension and clamping load. However, many tightening charts are based on dry or lightly oiled fasteners i.e. without optimum lubrication. Therefore, when an anti-seize compound is applied, the original input torque will not produce the same tension. Because quality anti-seize compounds are generally excellent lubricants, the required torque to produce the correct tension will be lower than for a dry fastener. 3. What is Torque Reduction Factor / Friction Factor? Because the use of an anti-seize changes the torsion-tension relationship of a fastener system, torque settings need to be recalculated. The dry/oiled torque value can be multiplied by a Torque Reduction Factor to produce the correct torque value for the particular anti-seize compound and material combination. Thus, the correct tension can be achieved. The torque-tension relationship for a dry/oiled fastener is extremely variable. Therefore, any value derived relative to this will inherit the same wide variability. It is only valid for a particular set of materials and fastener geometry. A torque reduction factor is not universally applicable for an anti-seize under any condition. The K-Factor is measured under a specific set of conditions. Therefore, if the fastener material, thread type (coarse, fine) or assembly (washer, no washer, self-locking) is different to the conditions that the K-Factor was measured under, it may not be valid and care should be taken to ensure that the correct fastener tension is achieved. 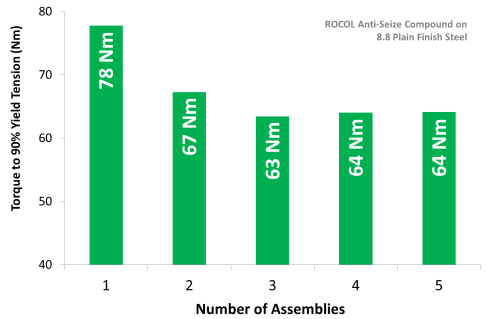 ROCOL provide K-Factors for each anti-seize product with a range of common materials. This ensures that more accurate fastener tensions can be achieved via this calculation method. The data shows that K-Factor can vary widely with fastener material. 5. What is the Friction Coefficient of an Anti-Seize Compound? The most accurate way to calculate the input torque that will produce the correct tension in the bolt is using the friction coefficient (μ). Whilst this is more complicated and intensive that the K-Factor equation, it is more accurate and allows variations in thread geometry to be taken into account. ROCOL report coefficients of friction for a range of common fastener materials. Therefore, using this method, the fastener material, anti-seize compound and thread geometry can be considered. However, care should still be taken with alternative bolt geometries (oversized washers, self-locking nuts) and if the bolt will be re-used (because the friction coefficient can change with re-use). ROCOL can provide guidance and adjusted parameters if an alternative equation is recommended for particular systems, please get in touch for more help.